The very neat castle of Eilean Donan sits on a small island in Loch Duich near Dornie, Scotland. 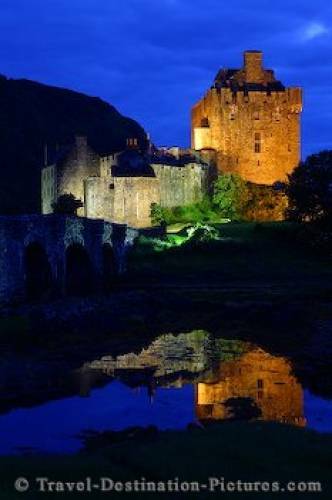 The castle is one of the most famous ones of scottish castles, not only because of staring as the McLeods castle in the feature movie Highlander. The castle was destroyed in the 17th century by spanish warships, but restored in the early 20th century to its current outfit. reflecting in Loch Duich at night, Scotland.